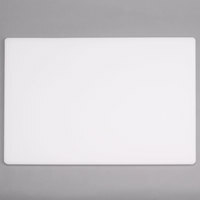 This 15" x 20" white cutting board is made of a solid, non-porous, high-density polyethylene material for safe food handling. Polyethylene is just soft enough to allow your knives to cut into the board slightly, meaning that it won't dull them, so you can be confident that your blades will remain sharp as you slice and dice your way through prep work. Its 1/2" thickness provides you with some heft for high-volume cutting tasks in your commercial kitchen while remaining easy to manage and store. Plus, its generous 15" x 20" cutting surface gives you ample space to work. Very resistant and easy to work with cutting board. it's is easy to clean and it doesn't slip when in use. I recommend this product. We bought 2 of these in use in our home kitchen and they are awesome. Super easy to wash and they've held up great after many washes. This cutting board is a perfect size for my small 18’’ deep prep table and it is light enough to easily clean in the sink and move to the garden for outdoor events. I ‘ve used boards that are thicker, sturdier, heavier and more expensive, but this one suits my needs for great portability and reduction in weight and size. Well packaged and shipped quickly. The cutting board is made in Taiwan. Nice cutting boards when you need something BIG. Worth noting that they do not fit in our home dishwasher easily. These have not warped yet after 3 months of regular use. This is a great cutting board. it is a nice size and holds up to a lot of cutting. it takes a beating when it needs to. Better and lighter than a thicker board this I discovered over time was prone to warping. This one also seems to stain less, even from food containing turmeric. Good cutting board for a table top. it is a little harder to move around the kitchen, so I would recommend it if you are going to be staying put and cutting for a while. Great large cutting board. We like it because you can push the already chopped stuff to one side as you keep chopping. Can warp if you don't store it flat. When you're in a midst of a weekday lunch rush, you need a cutting board that can stand up to the heat of paninis, substantial bread knives, and cleans with ease, which is exactly what you get with this commanding White Poly Cutting Board. I'd recommend purchasing one with a handle instead. These are more difficult to carry around the kitchen and don't clean up as nicely as the color coded ones. This is a great cutting board. It is a good size. The quality is great for the price! It doesn't dull your knife and I would recommend for others! These white poly cutting boards are an excellent and necessary addition to our kitchen. Not only do we use these cutting boards to cut kitchen products but we also use them to cut our fruit for the day. Great material and product! Hard to give a bad review to a cutting board. It does what its supposed to do. Holds up well to knife wear and tear over time and feels solid overall. For the price you can't really go wrong with this. Purchased 2 other thicknesses and sizes and pleased with all of them. Great cutting board for our commercial kitchen. we use them all the time at our restaurnat and they are very durable, easy to clean, will order again. The 15" x 20" x 1/2" White Poly Cutting Board is big but durable. It is versatile but great for cutting fruits and vegetables. It will not warp or break easily and is dishwasher safe. The price is great! Nice size cutting board that is small enough to use on the line but large enough to cut bigger items and still have room to move your knife. Easily bleached to sanitize and can be shaved down to extend the life of the cutting board. Great cutting Board. the price is perfect. the quality is amazing. buy it again and again however, will last so long. definitely you should buy it. This board is big, has some texture to it and is ready for all your culinary adventures. Use like any other plastic cutting board, with a towel between board and counter to prevent slipping. I am so glad I bought these cutting boards. They are thicker and more economical than most cutting boards. They also keep their bright white color. I give them a bleach bath once a week and they get cleaned with Dawn dish soap and scrubbed with a cutting board brush. The only bad thing about these boards is that they can be slippery so make sure to use a rubber board grip under the board. Great cutting board for preparing food. The size is perfect I have all the space I need weather cutting tomatoes, shredding cabbage, dicing ham or slicing brisket. Cutting board is a great size. Not to heavy, just the right thickness to have. Works great for cutting vegetables or cheese. I will be buying more when needed. quickly shipped and arrived within 2 days which is awesome. they're affordable and a decent thickness but they do take cuts pretty well so this isn't going to last forever. Very sturdy and thick cutting board. We used it to chop nuts and it has held up very nicely. We have several of these in our kitchen and will be ordering these again. Great cutting board for an awesome price. I was suprise on how big and heavy these are. I am very happy with the purchase and will be buying more. We have a few of these in our facility and they are perfect for to use as a large fruit preparation surface. The board holds up to regular use and cleaning/sanitization is very easy. These cutting boards are inexpensive. Easy to keep clean. But do not leave near heat, because they will warp. We keep a towel underneath them to keep them from slipping. I love this white cutting board. Just the right size for my kitchen. It doesn't cut the surface easily even with my sharp clever. I will order for more. These cutting boards are great for heavy duty use. They are think and large, which is helpful for production cooking. I also use them for culinary lessons and they are holding up nicely so far. This cutting board is very sturdy and cuts great. Its large size works wonderfully for cutting multiple onions and mincing the garlic at the same time. Easy to clean, no staining yet. Glad I ordered two. It was exactly what I wanted and I will be ordering more to use at home. Nice solid cutting board that appears will last. I am satisfied so far. The is sturdy and cuts great. I find no issues with this board. Its size works perfectly for large amounts of peppers and onions. Cleans well too. Nice cutting board! Only complaint is that it does tend to bend after repeat washes in a commerical machine. Nonetheless I would order this cutting board agin. Great cutting board for the price. It is very easy to clean and is nice and sturdy. Very large size, I can use it for multiple things. Nice cutting boards and you cant beat the price. I bought several of these and I use them primarily for vegetable prep or when I have multiple people in the kitchen and want to provide multiple work spaces. Plus they are so cheap you don't worry to much about them and they are my go to to grab and bring if i'm going camping or hosting a clam bake and plan on cooking outdoors. The only miscalculation I made is that these are just a hair to large to fit in my dishwasher (residential). I love this cutting board. I use it for cutting and entire 9x13" pan of brownies. It cleans up easily and doesn't damage the blades of my knives. I highly recommend. I really like this cutting board. It's easy to clean and hasn't stained yet. I only ever buy the white cutting boards. I just can't take myself seriously cutting up stuff on a yellow or blue one. This was a great purchased from webstaurant.com, thiscutting board looks and feel very durable, easy to clean and very sanitary if clean correctly. I would rcommend this product. Used in a home kitchen, great size for doing a variety of prep activities, often can prep nearly the entire meal on the one surface. Still looking great after a year of use, cleans easily. Really well constructed. I chose the white poly cutting board because it allows me to see where food stains are. You can even sand them down to clean them. Easy to keep clean, use it daily, stays in place without slipping. stains are easy to remove, Nice weight to it, and very nice size. This poly cutting board is just that a poly cutting board. It does what it was made to do and it is not over the top in cost. Very inexpensive cutting board for the high quality that it is. Since you have to change out your cutting board every few hours, I stocked up on these. This thing is a monster. Feels solid and offers a large cutting surface so the board never feels crowded. Easy to wash as well-- I'll never go back to the grocery store cutting boards. Great product for the cost and very durable product. Cutting boards are easy to clean and store. A lot cheaper than our local supplier again. A bit bigger than the small one with a handle, this gets big jobs done. Break down a big leg of lamb on this one. Excellent product! Easy to use, easy to clean, wash in machine. No warping and for messy jobs (or old boards) a little bit of bleach in a "soaking" sink will have this looking like new in no time. Does it's job well. Still looks brand new! Have had it for a year now and it's still in perfect shape. I highly recommend this cutting board. We bought several the cutting board. The size is perfect for a kitchen operation. They are easy to clean and will last for a long time. Nice cutting board - this cutting board needs to have a cutting board mat to place under it so it will not slide around while cutting food. Great Cutting board to do many tasks on. Kitchen could never go wrong with having one of these to cut on. Cleans very well an is easy to move and work it. Great Price! This item works great for what we need and we will definitely be order more in the near future. It was delivered quickly and on time and packaged perfectly. Nice big white cutting board at a great price! Nice thickness and will stay in place if you put a wet towel under it. Should hold up to a good beating. This thing is great. I don't know how I lived without such a big cutting board for so long but I use this all the time. You don't have to keep stopping to dump your stuff into the bowl/pan this way--just keep chopping till you're done, there's room on the board. I hand wash it so I'm not sure how it'd hold up in the dishwasher. The only thing that would've made it better is if I'd have sprung for the kind with the groove around the edge to catch drips. These are great cutting boards, they are thick and NSF approved. I'm cut 3/4s of an inch off the top of each one of mine and used them for my pizza prep table and they fit perfect! It's a good size and thickness. I bought this to use in the bakery for small chopping jobs, it will come in handy and will be easy to move around. Perfectly priced and can't have enough of these in the restaurant kitchen area. Able to quickly pull out a fresh one since cost makes having several on hand reasonable. great for slicing fruits and vegetables, easy to wash and dries fast. the quality of this white cutting board is amazing, feels like it will last me forever. i bought four of these for my four carving stations-very pleased with their quality! They are a good size and heavy duty-looked great on my carving stations! It is a great heavy duty cutting board, but I roll out dough with some tomato powder in it and it stains, but it can be cleaned by soaking some bleach on it. This is a great cutting board and gives you a nice big area to work on without pushing your food or you off when cutting or chopping on it. It cleans up nice, and stores nicely. This cutting board is great! Its held up though so much chopping, I didn't think it would last this long but the truth is its just a really great product for a really great price! This cutting board is very high quality for its price! It is a perfect size for any countertop and it does not slide around like other cheap cutting boards. Heavy duty. Great quality and thickness to provide adequate support for a kitchen. No knife marks left on the cutting board. Love it and would invest in additional boards. Great price for a really good size cutting board. I love the way these store easy and they are built to last a long time one of my favorites. this is a v ery nice small cutting board. purfect for preping small things like lemons. it is easy to use and easy to clean. This plastic white cutting board is great as an affordable replacement! Cheap enough that you can stock up on these!! Great for vegetable prep or butchering meats!!! A nice cutting board at a great price. It holds up well under daily knife use and also cleans easily. Ours has stayed white which is better than other brands we have used.